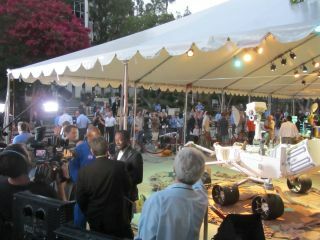 Musician will.i.am (center left) conducts an interview in front of a full-size model of the Curiosity rover on Aug. 5, 2012. A song called "Reach for the Stars" will make its debut, appropriately, from space. NASA plans to broadcast the tune, written by rapper and songwriter will.i.am, from its Curiosity rover, newly landed on the surface of Mars. Though Curiosity has no speakers, it will transmit the song via radio waves back to Earth to be received at 1 p.m. PDT (4 p.m. EDT) Tuesday, Aug. 28 during an educational event at NASA's Jet Propulsion Laboratory (JPL) in Pasadena, Calif.
"Members of the team that successfully landed the rover on Mars earlier this month will explain to students the mission and the technology behind the song's interplanetary transmission," NASA officials wrote in a statement. "will.i.am will then premiere 'Reach for the Stars,' a new composition about the singer's passion for science, technology and space exploration. During the event, NASA scientists and mission managers will talk about the Curiosity mission and explain the technology behind the broadcast to students. It won't be the first broadcast from space—NASA used the Mars rover to broadcast a spoken message from the space agency's chief, Charles Bolden, today (Aug. 17). The musician will.i.am, a member of hip-hop group The Black-Eyed Peas, was onsite at JPL Aug. 5 (PDT) to watch Curiosity land on Mars. The car-size, $2.5 billion rover is beginning a two-year mission to investigate whether Mars ever had the conditions necessary to support microbial life.